New! Combined Guide for McCall-Harby and McCall-Crabbs Books A-E. 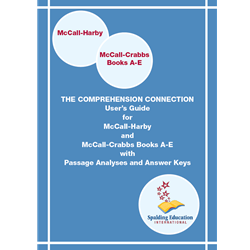 Provides text structure, point of view, topic or title, topic sentence, thesis statement, and stated or implied main ideas for McCall-Harby/Crabbs passages along with instructions for teaching text structure and the mental actions. Answer keys to passage comprehension questions included.